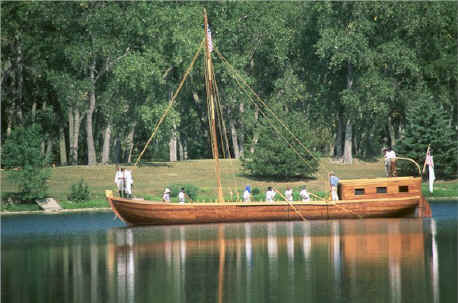 May 14, 1804 - Camp River Dubois, Illinois - The expedition began. Clark led the men in three boats; the 55-foot long keelboat and two pirogues of over 40 feet in length, one painted red, the other white. Clark wrote: "Rained the fore part of the day. I determined to go as far as St. Charles a french Village 7 leagues up the Missourie, and wait at that place untill Capt. Lewis could finish the business in which he was obliged to attend to at St. Louis and join me by Land from that place 24 miles; by this movement I calculated that if any alterations in the loading of the Vestles or other Changes necessary, that they might be made at St. Charles. I set out at 4 oClock P.M., in the presence of many of the neighbouring inhabitants, and proceeded on under a jentle brease up the Missourie to the upper Point of the 1st Island 4 Miles and camped on the Island which is Situated Close on the right (or Starboard) Side, and opposit the mouth of a Small Creek Called Cold water, a heavy rain this after noon." May 16, 1804 - St. Charles, Missouri, was a town of 450 people in 1804. Pierre Cruzatte and Francois Labiche, who were half-French and half-Omaha Indian, enlisted in the Corps of Discovery. May 20, 1804 - St. Charles, Missouri - Clark sent 20 of the men to the Catholic Church in St. Charles. Lewis rode overland from St. Louis to St. Charles. May 21, 1804. The expedition set out from St. Charles, Missouri. June 23, 1804 - Clark camped on shore after rounding Jackass Bend in Ray County, Missouri; the men camped on an island across from the later site of Fort Osage,built in 1808 under the supervision of Indian Agent William Clark. June 26-28, 1804 - Kansas City, Kansas - The men dried articles that had been soaked by river water; 8 or 10 hunters were sent out, and saw the first buffalo of the journey. July 4, 1804 - Near the site of modern Atchison, Kansas, the expedition celebrated the 28th year of American Independence. Joseph Field was bitten by a snake. The bow gun on the boat was fired and a gill of whiskey was issued to each man in celebration of Independence Day. July 24, 1804 - For several days the Corps stayed at a site they called "Camp White Catfish," within the area of Council Bluffs, Iowa and Omaha, Nebraska. Clark copied a map, while Lewis readied letters for President Jefferson; potentially they wanted to send this material back eastward with a few of the men, but decided against it. Many of the men were hunting, although game was scarce. Those who fished were more successful and caught catfish, from which the name of the camp was derived. August 1, 1804- At what the Corps called the Council Bluff Site, today's Fort Atkinson State Historical Park, Nebraska, they waited for Indian chiefs to arrive for a council. This was William Clark's 34th birthday, and he recorded "This being my birth day I order'd a Saddle of fat vennison, an Elk fleece and a bevartail to be cooked and a Desert of Cheries, Plumbs, Raspberries currents and grapes of a Supr quality. 3 Deer and an Elk killed to day The Indians not yet arrived. a Cool fine eveninge Musquetors verry troublsom, the Praries Contain Cheres, Apple, Grapes, Currents, Raspberry, Gooseberry Hastlenuts and a great vairety of Plants and flours not common to the U S What a field for a Botents [botanist] and a natriless [naturalist]". August 2, 1804 - Council Bluff site, Fort Atkinson State Historical Park, Nebraska - At sunset, six Otoe chiefs and their warriors, with a French interpreter, Mr. Faufong, arrived; on the morning of August 3, Lewis and Clark gave out peace medals to the Otoe and Missouri chiefs. August 11, 1804 - The camp was at what is today Badger Lake, near Whiting, Iowa - Lewis and Clark honored Black Bird, a chief of the Omaha Indians who died four years earlier, by climbing to the top of his mound grave with ten men and planting a flag. They stated in the journals that over 400 Indians, including Black Bird, had died of smallpox in an epidemic four years previously. August 18, 1804 - near modern Homer, Nebraska - this was Capt. Lewis' 30th birthday. A court martial was held for Pvt. Moses B. Reed, who had deserted and was tracked down, captured and returned to camp. He was expelled from the permanent party and ordered to return to St. Louis from the Mandan villages in the spring - in addition, he had to run the gauntlet four times through. The Otoe chiefs thought this punishment harsh until Reed's great offense was explained to them. An evening meeting was held with the Otoe chiefs, followed by a dance which lasted until 11 p.m. An extra gill, a ¼ of a pint, of whiskey was issued to each man. August 20, 1804 - Near modern Sioux City, Iowa - The only member of the Corps of Discovery to die on the expedition, Sgt. Charles Floyd succumbed to what is now believed to have been appendicitis. The military funeral was conducted by Capt. Lewis. August 23, 1804 - One mile southeast of Vermillion, South Dakota. A wide variety of wildlife was sighted on this day; Joseph Field killed the expedition's first buffalo. August 25, 1804 - Lewis, Clark, Ordway, Drouillard, Shields, Joseph Field, Colter, Bratton, Labiche, E. Cann, Warfington, Fraser and York walked to Spirit Mound, seven miles north of Vermillion, South Dakota,said by Indians to be a place of evil or mischievous spirits. ". . . in an emence Plain a high Hill is situated, and appears of a Conic form, and by the different nations of Indians in this quarter is Suppose to be the residence of Deavils. That they are in human form with remarkable large heads, and about 18 Inches high, that they are very watchfull and are arm'd with Sharp arrows with which they Can Kill at a great distance; they are Said to kill all persons who are So hardy as to attempt to approach the hill; they State that tradition informs them that many Indians have Suffered by those little people, and among others Three Mahar men fell a sacrefise to their merceless furry not many Years Sence. So Much do the Maha, Soues, Ottoes and other neighbouring nations believe this fable, that no Consideration is Suffecient to induce them to approach the hill." August 30, 1804 - Calumet Bluff, at modern Gavins Point Dam, South Dakota - A council was held with the Yankton Sioux at which Clark made a speech and distributed presents and peace medals. The Yankton danced until late at night on the Dakota side of the river. Sept. 7, 1804 - The camp was at "the Tower,"four miles southeast of the Nebraska/South Dakota border on the Nebraska side, near Niobrara National Scenic Riverway. The men investigated a prairie dog town and described it for science. Sept 11, 1804 - Private George Shannon was found. He survived on the prairie for 12 days on a few wild grapes and a rabbit. Sept. 24, 1804 - Within the boundaries of modern Pierre, South Dakota,the Corps met and had a confrontation with the Lakota or "Teton" Sioux. The following day the men raised a flag and put up the sail awning for a council. The Lakota began to arrive about 11 a.m.; after a ceremony much like those of the past few months with other Indian tribes, the Lakota leaders feigned drunkenness and asked for more presents, declaring they would not let the Corps go on without them. The Second Chief, called the Partisan, threatened Clark, who drew his sword and called the men to arms. A potentially disastrous confrontation was finally diffused when the Lakota backed down. October 26, 1804 - Mitutanka, the first Mandan earth lodge village, near Stanton, North Dakota - Lewis and Clark finally arrived at the Mandan villages - 1,600 miles by their estimate from Camp River Dubois. There were two Mandan villages and three villages inhabited by the Hidatsa and Arahami tribes. These three groups lived in close proximity and harmoniously, sometimes joining forces against their principal enemy, the Sioux. They traded their agricultural products with other tribes in the region. Lewis and Clark estimated that the population of the five villages, located within an 8 x 2 mile rectangle, totaled 4,400. About 1,400 of these people were adult males, 700 Mandans, 650 Hidatsas, and 50 Amahamis. Clark recorded: "We came too and camped about 1/2 a mile below the 1st Mandan town . . . soon after our arrival many men womin and children flocked down to See us. Capt. Lewis walked to the village with the principal Chiefs and our interpreters, my Rhumatic complaint increasing I could not go." Lewis and Clark had already decided to stay for the winter with the friendly Mandan and Hidatsa Indians, where food would be available. The Indian villages added a measure of protection as well, and the explorers were interested in noting the customs of these fascinating people. Nov. 2, 1804 - Near modern Stanton, North Dakota. One of Lewis and Clark's first tasks was to survey the area to find a suitable spot for their winter camp. A place was selected on the east, or north, bank of the Missouri about 6 air miles below the mouth of the Knife River on a point of low ground sheltered by bluffs. It was directly opposite the lower of the five Mandan villages. On November 3 the men set to work building Fort Mandan. It apparently consisted of two rows of huts, or rooms. Each row contained four units which were connected by a palisade on the river side. The fort was not finished until Christmas Day, but the men moved in before that because of the cold weather. The actual site of Fort Mandan has been washed away and lies partially underwater, although the State of North Dakota has built a replica about 10 miles downriver. Clark recorded: "This Morning at Daylight I went down the river with 4 men to look for a proper place to winter proceeded down the river three miles and found a place well Supld. with wood and returned, Captain Lewis went to the Village to here what they had to say and I fell down, and formed a Camp, near where a Small Camp of Indians were hunting cut down the Trees around our Camp . . . "
Nov. 4, 1804- Fort Mandan, North Dakota - Toussaint Charbonneau was signed as an interpreter for the coming journey, along with his Shoshoni wife, Sacagawea. Dec. 17, 1804 - Fort Mandan, North Dakota- The temperature was 43° below zero; Mr. Hugh Heney of the Northwest Company made sketches for the captains of the country between the Missouri and the Mississippi rivers, and a Mandan man made sketches of the land to the west. Dec. 25, 1804 - Fort Mandan, North Dakota - Sgt. Patrick Gass recorded that "Flour, dried apples, pepper, and other articles were distributed in the different messes to enable them to celebrate Christmas in a proper and social manner." Three rations of brandy were served during the day, which was mainly spent in dancing. Clark mentioned giving the men Taffia, which was a cheap form of rum made in the West Indies: "I was awakened before Day by a discharge of 3 platoons from the Party and the french, the men merrily Disposed, I give them all a little Taffia and permited 3 cannon fired, at raising Our flag, Some Men Went out to huntr and the others to Danceing and Continued untill 9 oClock P.M. when the frolick ended.